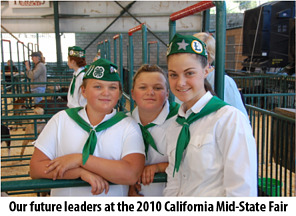 The Junior Livestock Auction at the California Mid-State Fair generates hundreds of thousands of dollars for the youth in the community. The buyers at the Livestock Auction are supporting the investments, hopes and aspirations of the participants. IQMS’ sponsorship of the Junior Livestock Auction at the California Mid-State Fair is the functional equivalent of offering thousands of dollars in scholarships to dozens of young ambitious entrepreneurs. The Future Farmers of America (FFA) and 4-H are both organizations that foster leadership, personal growth and career success. It’s no coincidence that IQMS is based in San Luis Obispo County, where agriculture is the primary business. The work ethic of an agricultural community generates a positive “can-do” attitude with attention to integrity and discipline. These youths are more likely to be high achievers, reaching for greater success in school, in college and in their communities. The funds generated by the Junior Livestock Auction go directly to the participants. From the letters received in advance of the event, and the thank you letters after, it’s apparent that these kids are motivated and intend to invest in their own educations and build their own college funds in order to set greater control of their destinies. They take on the responsibility and achieve their success through hard work; this is success they can take pride in. IQMS also generously sponsors local SkillsUSA organizations and local Robotics teams, offering the youth of the community additional opportunities to learn skills and trades, and gain greater experience in fields that may result in profitable careers, but undoubtedly results in more productive adults. All of these programs are in line with our philosophy of directly supporting the youth of our area in order to ensure the supply of an educated, motivated and responsible future workforce.